If you're going to name a motorcycle after one of the greatest Formula One drivers who ever lived, it had better be damn good. Fortunately, the motorcycle company doing this is Ducati, and they're old hat at making two-wheel tributes to Ayrton Senna by now. This is the Ducati 1199 Panigale S Senna, and it was unveiled in Brazil earlier this week at the Sao Paulo Motorcycle Show. But rather than being just an attention grab that shamelessly uses the name of Brazil's famous and dearly departed F1 champion, this bike is a sequel of sorts to a motorcycle made in the 1990s with Senna's approval. Ducati says the menacing red-and-grey color scheme of this bike was chosen by Senna himself during a visit to the factory just a few weeks before his untimely death at Imola in 1994. The livery was used to produce series of 300 motorcycles designed to honor the star in 1995 called the 916 Senna I. Two more versions, the 916 Senna II and 916 Senna III, were built in 1997 and 1998. And now the Senna bike is back with the approval of the Senna Foundation and with a racing exhaust for good measure. 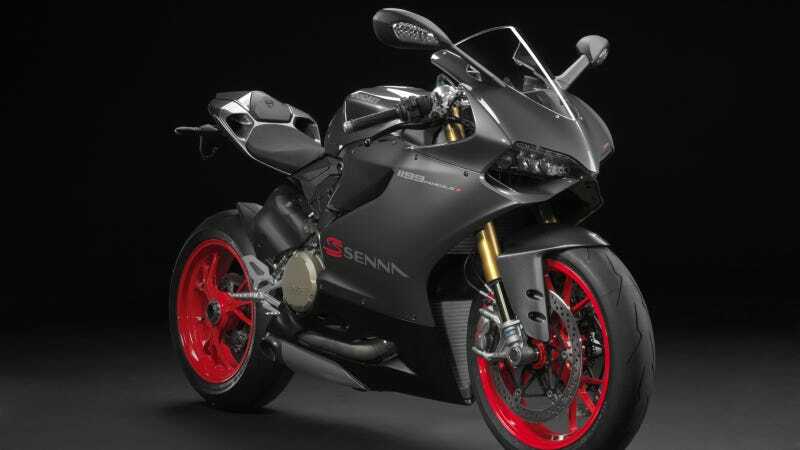 This new one is a 1199 Panigale S, and only 161 will be built — the number of F1 races Senna competed in. The only bad news for die-hard Sennaphiles who love two-wheel fun is that the bikes will only be sold in Brazil. I think Senna would have liked it. I wonder how it does in the rain?